On that day, Archbishop Giovan Battista Pichierri blessed a plaque that was placed at the entrance of the school and a bronze bas-relief inside the school, depicting Luisa Piccarreta. 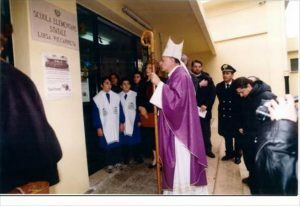 There was, then, the Eucharistic celebration with the participation of 500 children, teachers and religious and civil authorities. This was the beginning of an occasioning relationship, to remember together the most significant stages of the life of Luisa Piccarreta as her birth and transit, as well as the Christmas and Easter seasons. The children, accompanied by their teachers, came often to visit the places of Luisa and her tomb. On 23 April 2003, 300 children with their headmaster went to Luisa’s tomb, to commemorate her birth. For that occasion we published a short biography suitable for children of the primary school “Who is Luisa Piccarreta?” This gift was appreciated and remained as a souvenir.